Early records of the Club are few and far between. One of the earliest reports, however, is in the West Buckland School Magazine recording that in 1888, the Reverend R.W.S. Vida playing for Bideford CC scored the first century against the School. From 1874 until 1904, there existed in Westward Ho! the United Services College and a plaque indicates that Rudyard Kipling was educated there from 1878 until 1882. The present cricket ground at Westward Ho! was part of the College grounds where cricket was played and, when the College closed, the ground was purchased by parents of children at the College, who subsequently sold it to the local authority with a suitable restrictive convenant preserving the ground for recreational purposes. The earliest positive evidence of cricket clubs at Westward Ho! is a fixture card issued jointly by The Northam C.C. and Westward Ho! C.C. for 1902. Fixtures were played at Westward Ho! and on The Burrows, and Bideford and Appledore also had cricket clubs. During the 1939-1945, the cricket ground at Westward Ho! was used by the Army. 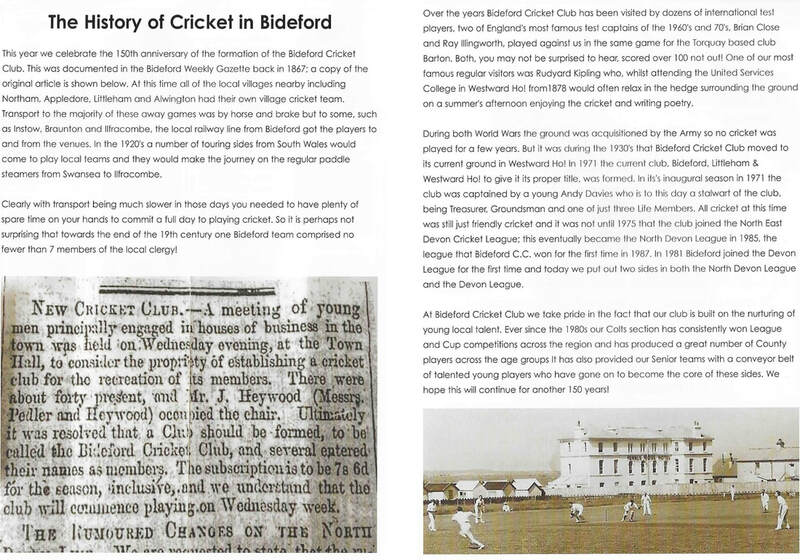 By 1948, the Bideford Club had reformed and club cricket began to emerge though an amalgamation subsequently took place in 1970 involving the Bideford & Westward Ho! and the Littleham Cricket Clubs. This was the beginning of the Club as we know it today. A 28 year lease was negotiated with the local authority, proposals were put forward for a new Clubhouse and grants applied for. The amenities have been improved and about 100 home fixtures are played each season in the Devon League, North Devon League, Cups, and Colts at Under 15, 13 and 11, in addition to mid-week friendly games.